I’m spending a few weeks in Korea, mainly for the Academy of Korean Studies organised World Congress of Korean Studies that will be taking place this weekend in Chejudo. A few days ago I had the enjoyable experience of visiting the Hongsŏng area (South Ch’ungch’ŏng Province) together with one of our other contributors, Pak Noja. This was a sort of pilgrimage to see the birthplace of Manhae Han Yongun (1879-1944), the Buddhist reformer, poet and political activist whose writing we have been translating together. We also had the opportunity to visit the lovely Sudŏksa temple nearby, a place I would highly recommend. Seeing the site of Manhae’s birthplace brought a number of thoughts and feelings to mind, but the sense of being somewhere historically significant or imbued with any atmosphere was unfortunately not one of them. Of course, this could be attributed to my attitude as much as anything else. But seeing a place that has been so obviously constructed in very recent times as a facsimile of the location where Manhae may have been born, I think most people might have similar feelings. 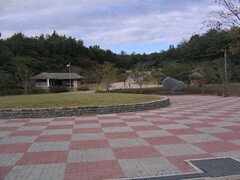 The site consists of two small thatched cottages (초가집) one of which is the management office and the other a replica of the house where Manhae was born. Higher up, there is also a shrine to Manhae in the usual style of a small building within a walled compound with a grand gate. 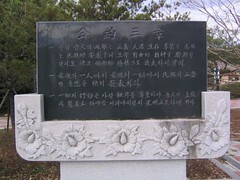 Besides that there is an expanse of freshly-paved wasteland, a few stele with inscribed poems (시비) and what appears to be a small museum, currently under construction. Although it seems they were constructed in the early 1990s, the two thatched cottages were nicely done and pretty enough. But I think there were two things about this place that made it profoundly ‘ahistorical’ for me. One was the expanse of paved ground, a barren nothingness, ready to be trampled on by hordes of daytrippers or school children (actually the place seems rather forlorn and only one coach turned up while we were there). The other was the lack of any real context – it seems that whatever material remains of the village where Manhae was born and lived have long since disappeared to be replaced years later by these disembodied symbols of the world that the young Han Yongun existed in. 1. This work of ours is in behalf of truth, religion and life undertaken at the request of our people, in order to make known their desire for liberty. Let no violence be done to anyone. 2. Let those who follow us every man all the time, every hour, show forth with gladness this same mind. 3. Let all things be done decently and in order, so that our behavior to the very end may be honorable and upright. Yesterday I went for a look around the new National Museum of Korea, located at Ich’on in Seoul, on what I believe was once a US Army golf course. As you can see from the picture below, this site of historical education has a similar expanse of emptiness in front of it, heightening the effect of the massive blank walls of the building. In some ways I quite like this sort of brutalist architecture, but you can’t help feeling that this is a crude attempt to impose upon the visiting masses a sense of awe at the weighty authority of Korean history. 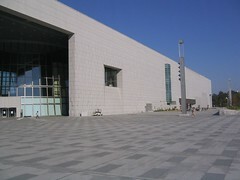 What I saw of the exhibitions inside (the history section) , was excellent however. I would recommend the parts on Chosŏn dynasty socio-economic life, thought and international relations which are refreshingly clear and lacking in nationalistic tones. I don’t have anything against using reproductions per se, in fact, I think the most important thing is context and explanation. From what little I saw of the inside of the museum that aspect seemed quite good. I also liked the fact that the parts I looked at used a nice mixture of material culture items and documents to illustrate Korea’s premodern past. Having said that, one criticism I would make is of the explanations provided for non-Korean speakers. The English, Japanese and Chinese explanatory texts are much reduced from the Korean originals and the labels next to items are in tiny writing. I’m not sure how much this would allow non-Korean speakers to understand exactly what is being shown. Yes I agree the Korean national museum is mostly empty of history. I suppose that Koreaphiles will gobble up any thing Korean like roll of kimbap, but I found going to the Korean national Museum to be a waste of time. One bit of ‘history’ that I am pretty sure owen would like is a two meter replica of the samuri sward of Lee sun shin. Its fake, so owen will like it. It looks like it was made about 10 years ago. It is also a style that was never used by the koreans. And the biggest laugh is that the thing is two meters tall. I could go on but people in this blog dont seem too interested in history. Wow, I’ve heard some bizarre non sequiturs but that is a real prize winner. Did you read the post first? It seems that writing anything about Korean history, even if it’s from a critical, academic or entirely neutral point of view, counts as evidence of the heinous crime of ‘Koreapilism’, right up there with necrophilism, paedophilism and all those other philisms. Now please troll your way over to Frog in a Well China and Frog in Well Japan and rant incoherently there about ‘Sinophiles’ and ‘Japanophiles’, for the sake of consistency if nothing else. By the way, I didn’t see the ‘samuri sward’ but it certainly sounds intriguing. Is Owen in Korea for the annual one week trip that is considered as necessary for Koreanologists. It was three weeks actually. One week is far too little time for serious cultural imperialism.